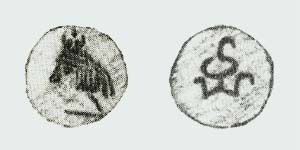 Imitation of tetradrachm of Bactrian king Eucratides, later 2nd century B.C. Obverse: Helmeted bust of king right. Reverse: Distorted Greek legend PAΣIΛEΩΣ MEΓAΛY; EYKIATIΔY below. Dioskouroi on rearing horses. Monogram �HT� in the right field, tamgha in the left field. Unknown ruler, 1st century B.C. Obverse: Crowned bust of beardless king right. Reverse: Distorted legend: IVXIVEΩVIIEΓΛVΛEIVIΛVI. Dioskouroi on rearing horses. Monogram in the right field, tamgha in the left field. Unknown ruler, later 1st century B.C. � early 1st century A.D.
Obverse: Crowned bust of bearded king right. Nike flying behind. Reverse: Distorted legend: IVIVEΩIEΩΓΛVE EIΛVIΛΓ. Crowned and diademed horseman. Tamgha in the left field. Unknown ruler, middle 1st century A.D. Reverse: Distorted unreadable Greek legend. Crowned and diademed horseman. 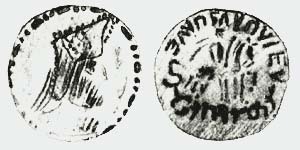 Khwarezmian legend with king�s name below (part of the coin where the name should be is broken off on both known specimens). Tamgha in the left field. 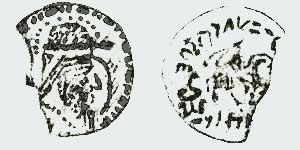 Obverse: Tamgha with a dot in the center. 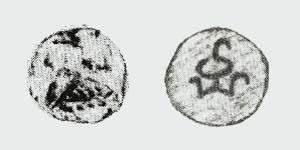 These coins were mostly restruck on the Kushan cut copper coins. 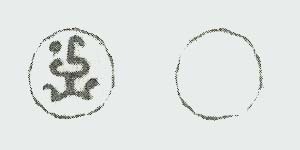 Possibly, this is the first attempt at a copper coinage in Khwarezm. King Artav, later 1st century A.D. Reverse: Distorted unreadable Greek legend. Crowned and diademed horseman. Khwarezmian legend with king�s name below ('rt'w MLK'). Tamgha in the left field. 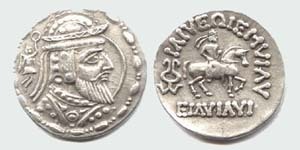 King Artav, late 1st century A.D.
Obverse: Khwarezmian legend �rt�w, without a title. 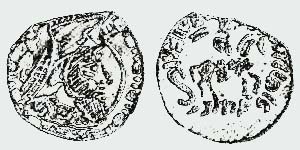 Obverse: Distorted Khwarezmian legend �rt�w, without a title. Obverse: Diademed bust of bearded king left, diadem with a crescent. 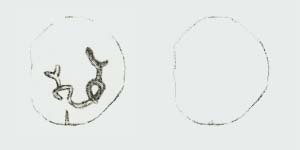 Reverse: Tamgha in the center. 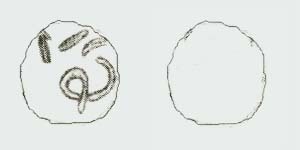 Perhaps imitation of Parthian coins. 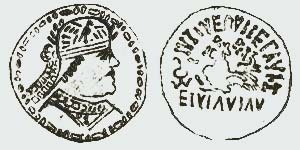 Obverse: Diademed bust of beardless king left, diadem with a crescent. 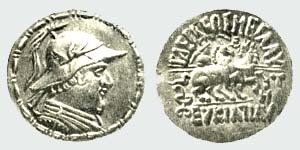 King Artramush, later 2nd - early 3rd century A.D. Reverse: Distorted unreadable Greek legend. Crowned and diademed horseman with a spear. Khwarezmian legend with king�s name below (wrtrmws MLK'). Tamgha in the left field. Reverse: Distorted unreadable Greek legend. Crowned and diademed horseman with a spear. Khwarezmian legend with king�s name below. Tamgha in the left field. King Artramush (? 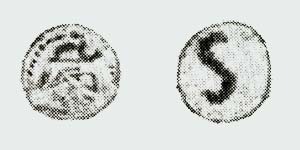 ), later 2nd - early 3rd century A.D.
Obverse: Crowned head of king right, crown with a crescent. 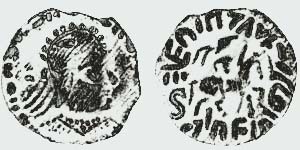 During the same period, found in circulation are the Kushan copper coins overstruck with this tamgha. Copyright �2002-2010 "VLD & OK"